Oil Minister Shaikh Mohammed bin Khalifa Al Khalifa has delegated Shaikh Nawaf bin Ibrahim Al Khalifa, Chief Executive Officer of the Electricity and Water Authority, Deputy Minister of Oil, to inaugurate the Middle East Energy Summit in its first edition in the Kingdom of Bahrain as part of the 21st Middle East Oil & Gas Show (MEOS 2019). 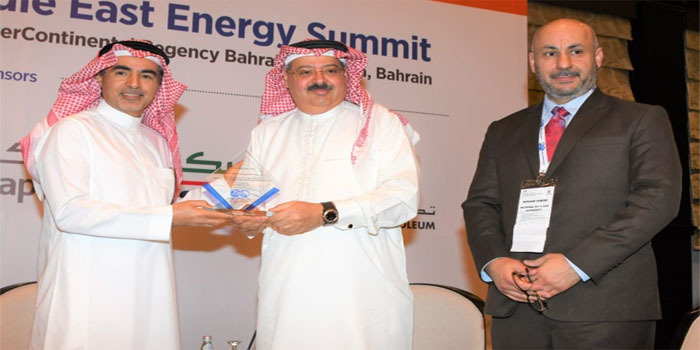 Shaikh Nawaf welcomed the holding of this important event in the Kingdom of Bahrain in its first edition, praising the important topics that will be presented in the discussion sessions with the participation of speakers from various companies and institutions concerned about the energy sector, wishing all the success to achieve the goals of the summit. He said that the world is witnessing many difficult challenges at various levels, including industries, transport and energy, which need to develop safe, sustainable and modern strategies in line with rapid developments in order to meet the growing demand for energy resources and maintain the growth and prosperity of the global economy. The importance of studying these challenges and analysing them and taking advantage of experiences from various international bodies specialised in energy and turning them into investment opportunities for development towards the progress, growth and prosperity, is important for this sector. He added that rapid changes, fierce competition, many complex challenges, the emergence of the fourth generation of industrial revolution, modern technologies and rapid developments in the global markets have made companies, institutions, and universities seriously focus on investment towards innovation, development research and the use of modern technologies to improve products. These products are in line with international standards and are of high quality, competitive in the market and meet the market needs of energy sources. The participants discussed relevant topics including building flexible and sustainable energy strategies, improving energy economics, energy technology and innovation, energy best practices and lessons learned, and energy management through the development of specialised policies in the energy sector. They also discussed the exchanging of expertise, information and experiences in the field of energy. Next article Sukuk Al-Salam issue 215 oversubscribed by 292%.